Louis Riel was a Métis leader who is considered the father of Manitoba. 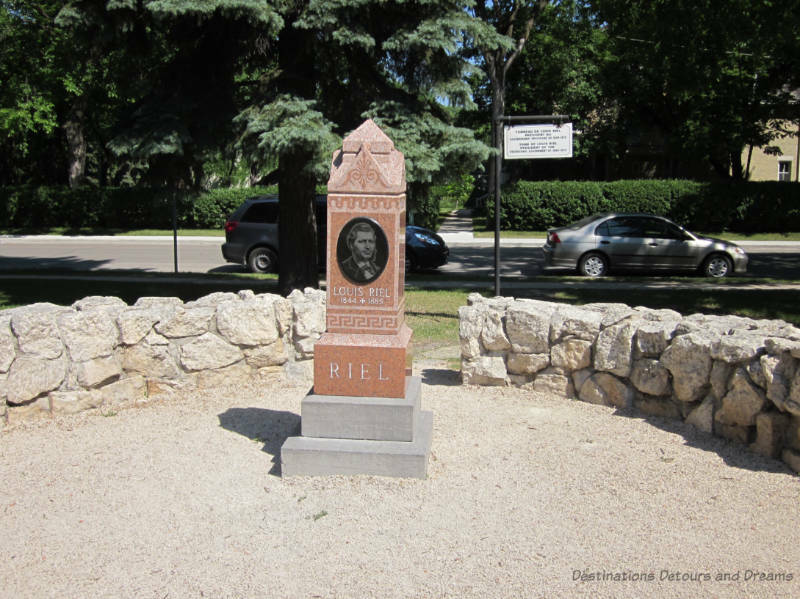 Riel was a controversial figure. When baby boomers like myself learned about him at school, he was largely portrayed as a traitor. Today historians recognize the important role he played in Manitoba becoming part of Canada and consider him a freedom fighter for his people. This was the Louis Riel my daughter learned about in school. 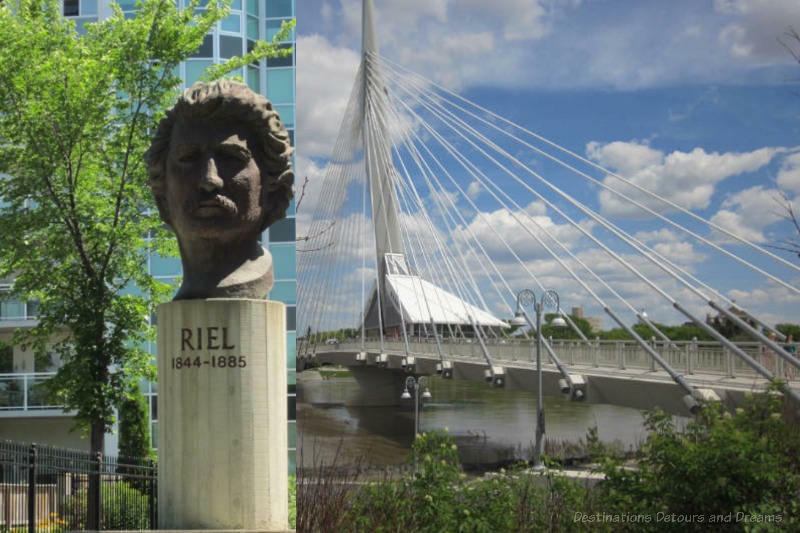 Whether you know a lot about the Louis Riel story or whether it is brand new to you, there are several places in Winnipeg where you can find out more about the man and his effect on history. The St. Boniface Museum is one of the best places in the city to discover Louis Riel. His story is at the heart of the museum. 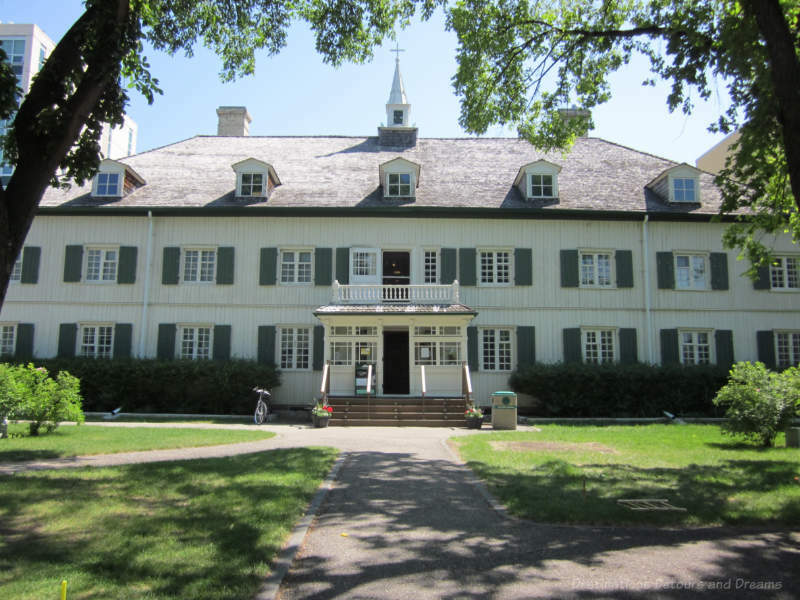 Housed in a former Grey Nuns’ convent built between 1845 and 1851, the museum contains artifacts relating to Western Canada’s French-Canadian and Métis heritage. In 1869, when the Hudson Bay Company agreed to sell Rupert’s Land, a huge area of land encompassing a third of what is now Canada, to the Dominion of Canada, the French-speaking Métis people feared losing their rights and way of life. The Métis are a recognized Canadian aboriginal people of mixed European and First Nations heritage. When the Dominion sent out crews to conduct surveys in preparation for the land transfer, the Métis formed the Métis National Committee to protect their rights. 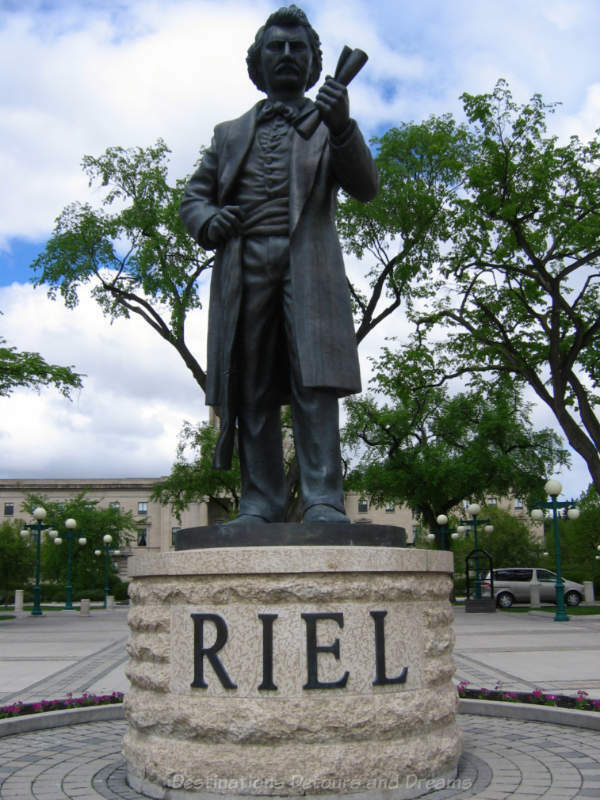 Just twenty-five at the time, the well-educated and eloquent Louis Riel became their leader. Their protest led to the Red River Resistance (also called the Red River Rebellion) and saw Riel head a provisional government from 1869 to 1870. He eventually negotiated the Manitoba Act that saw Manitoba become a Canadian province and protected French language rights. During the time of Louis Riel’s provisional government, he allowed an agitator to be tried and executed for insubordination. Fearing a lynching by angry eastern Canadians, he fled to the United States for a four-month voluntary exile. He successfully ran for Parliament, but was expelled before he took his seat. He was granted amnesty for a crime he was never convicted of with the proviso he spend five years of “banishment” from the Dominion of Canada. He returned to the States and suffered a breakdown. Friends secretly brought him to Montreal, Canada for treatment. Between 1879 and 1883, he lived in Montana territory, took American citizenship, married and became a school teacher. 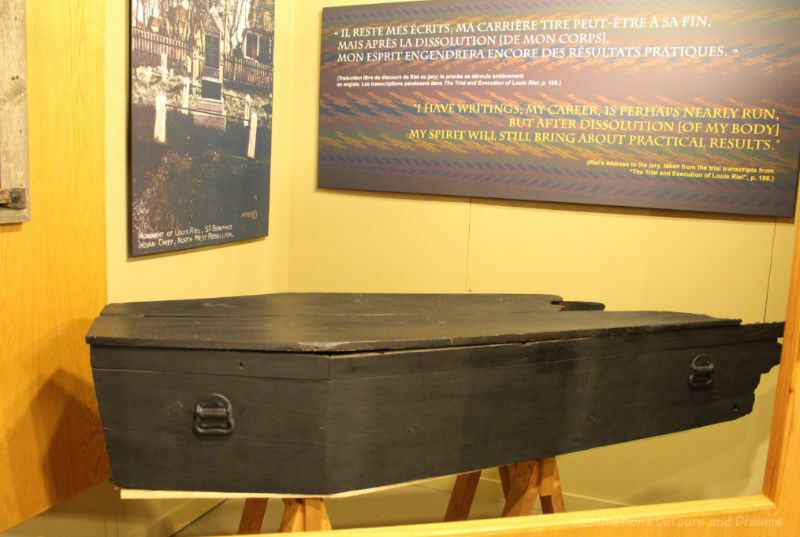 Louis Riel’s original coffin at St. Boniface Museum. He was transported in this back to Winnipeg where he was moved to another coffin. There is more about the story of Louis Riel at St. Boniface Museum as well as information about French-Canadian life and history. Just down the street from the St. Boniface Museum is the St. Boniface Cemetery where Louis Riel is buried. Initially marked by a plain wooden cross, a granite tombstone now marks his grave. In 1884, the Saskatchewan Métis asked him to negotiate for them. Seeing an opportunity to build a Métis homeland, Riel returned to Canada. The government sent soldiers instead of negotiators. Métis resistance was defeated in the North-West rebellion at Batoche in 1885. A jury of six English-speaking Protestants found Riel guilty of treason, but recommended mercy. Instead he was sentenced to death. Attempted appeals were dismissed. He was hanged in Regina in November, 1885. 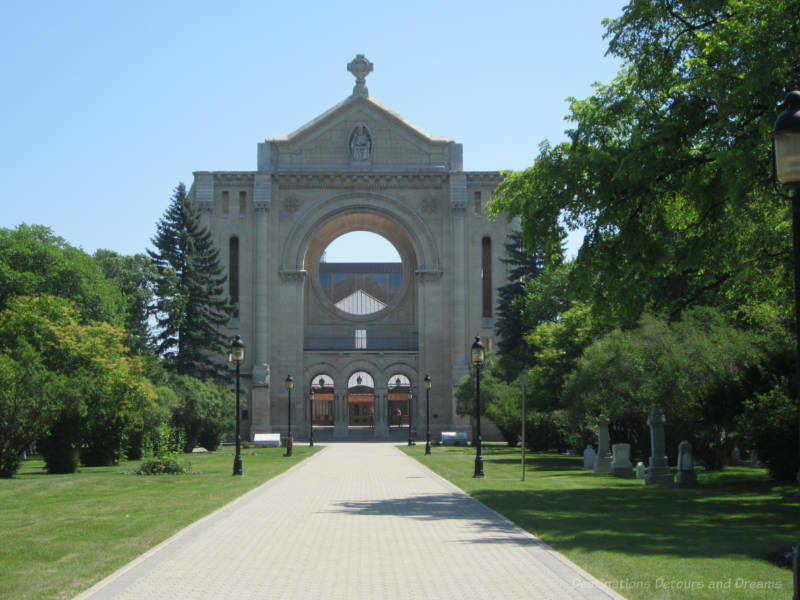 The cemetery is on the grounds of St. Boniface Cathedral, in front of the impressive stone walls dating to 1905. The walls were all that remained after a fire in 1968 destroyed the church. Behind the walls, the old blends into the new with a newer church designed by architect Etienne J. Gaboury. During the Red River Resistance, the Métis National Committee took control of Upper Fort Garry. 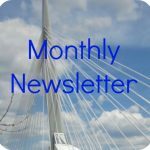 From inside the Fort’s walls, during the winter of 1869 – 1870, they presented Canada with a Bill of Rights that led to the Manitoba Act and Manitoba becoming the fifth province of Canada. 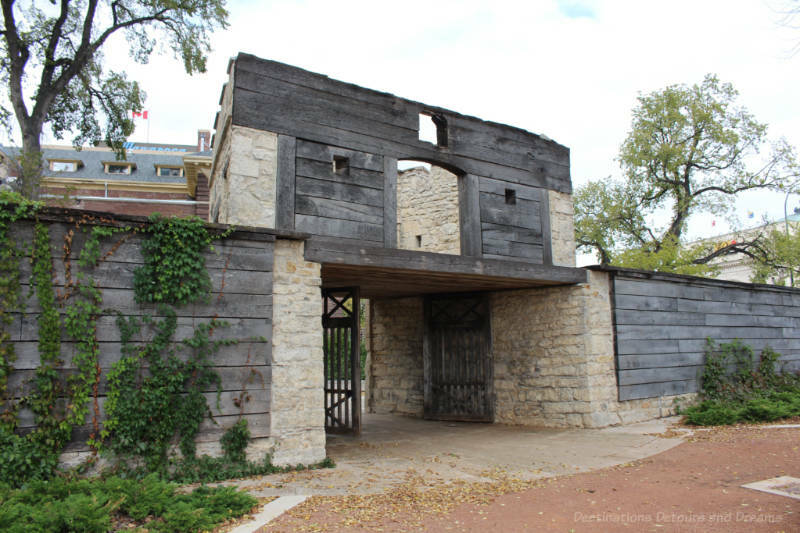 Ten years later the fort was no longer in use and was gradually demolished. Only the Governor’s Gate remained. Today that gate and the land where the fort stood is a provincial park. 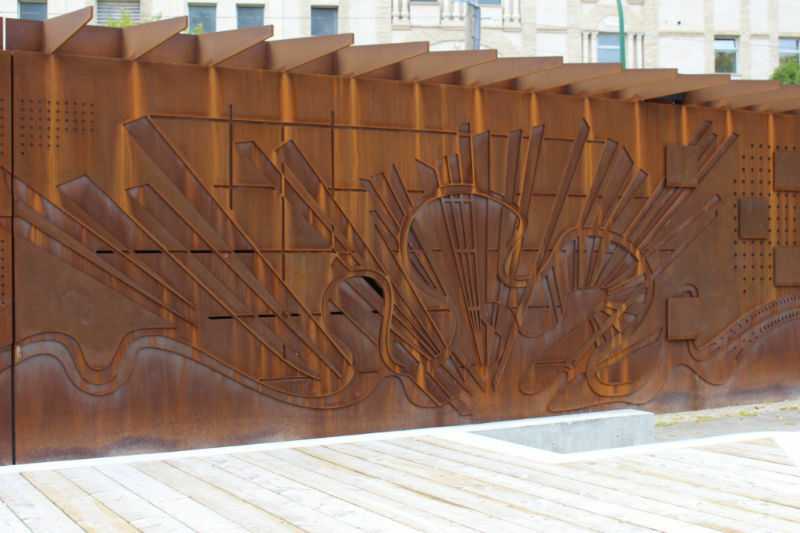 A Heritage Wall of weathering steel at the back of the park contains symbols representing the history of the fort and of western Canada. The Red River Resistance is represented on that wall. Unique architecture and thoughtful exhibits at the Canadian Museum for Human Rights foster reflection and discussion and inspire hope and action. 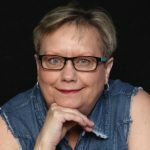 Canadian Journeys, one of the museum’s ten galleries, explores the steps and missteps on the road to greater rights for everyone in Canada. One of the over a dozen stories in the gallery features Louis Riel. There is a quote from Riel in the display A Nation Reclaimed, “Ours is a battle for homes and human rights.” The exhibit is about Métis rights. As such, you won’t find a lot of detail about Riel’s life, but rather bits about his role in the overall Métis struggle for recognition of their independent identify. In 1982, the Métis were legally recognized as one of Canada’s three Aboriginal peoples, along with the First Nations and Inuit. 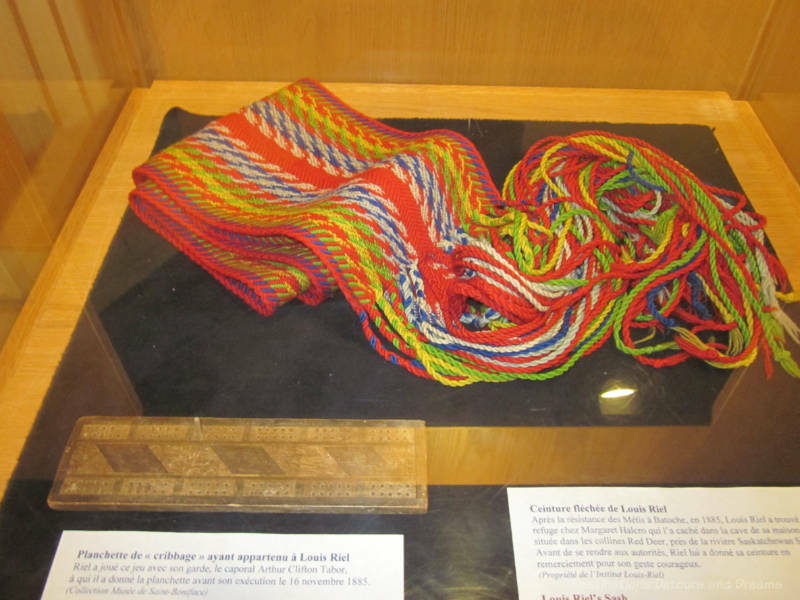 The Louis Riel story is not covered in great depth and is just one small part of the many stories in the museum. Those other stories are well worth exploring. 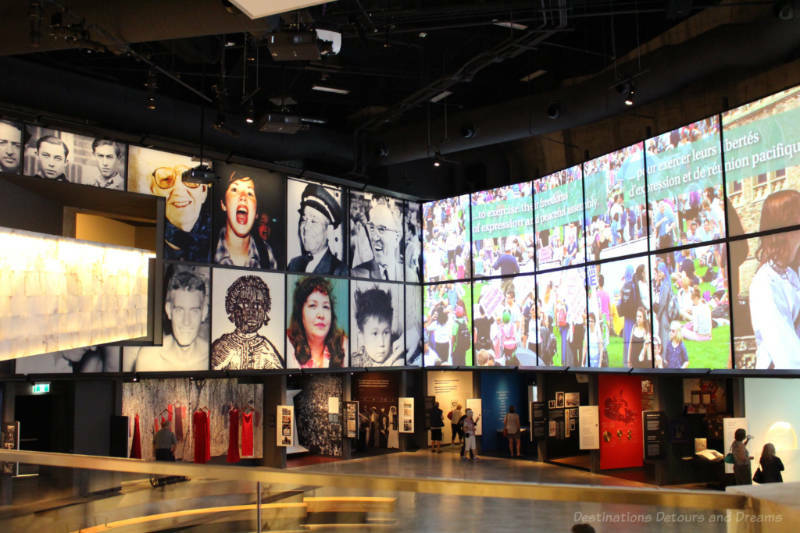 The Canadian Museum for Human Rights is one of Winnipeg’s top tourist attractions. 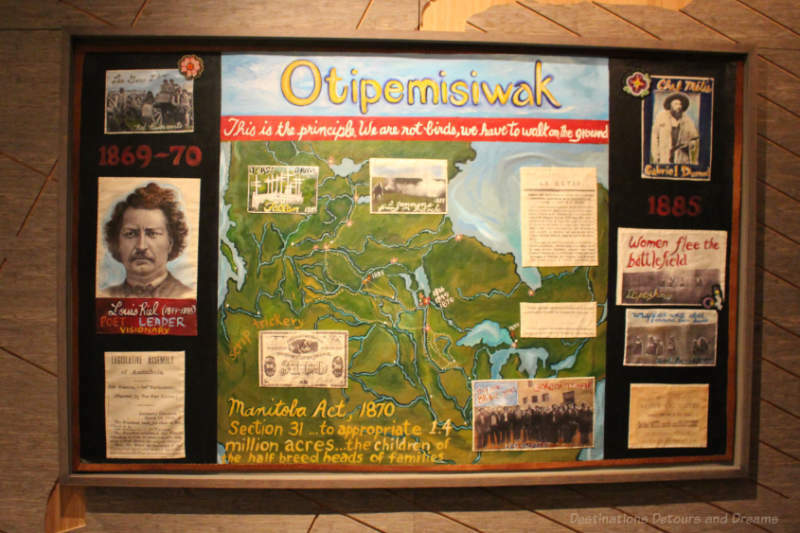 The museum also offers a Métis Rights Tour that explores how the Métis have influenced Canada’s human rights journey and the impact of Louis Riel. Two weeks advance notice of booking a group Métis Rights Tour is preferred. 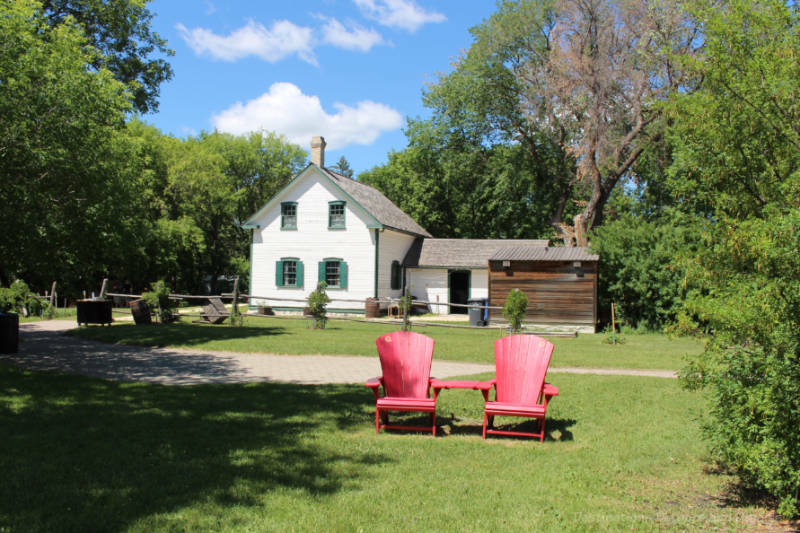 The Riel family home along the Red River is now a national historic site, open to the public in summer months. 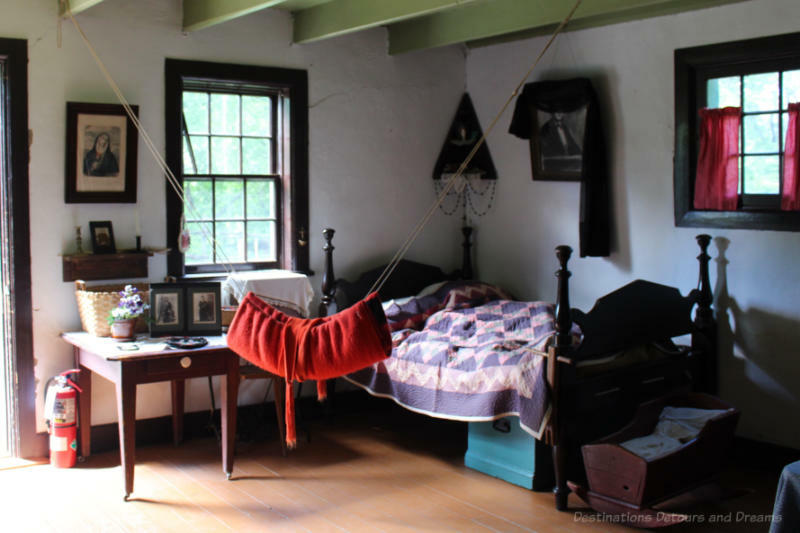 Louis Riel never lived in the present Riel house on display which was built around 1881, but his body did lie in state there for two days after his execution. Growing up, Riel lived in two previous houses on the family’s river lot farm. Riel’s wife Margueritte died in this house the spring after Riel’s execution. Their children were cared for by Louis’ mother and brother. The house, located in south Winnipeg at 330 River Road, has been restored and furnished to reflect the spring of 1886, when the family was still mourning Riel’s death. A statue of Louis Riel stands on the grounds of the French language public university Saint Boniface College. The monument is a two-part structure, an outer shell of two rounded 30-foot-high half-cylinders with Louis Riel quotations etched on it, and a 12 foot high cement sculpture of Louis Riel. The statue is the work of Marcien Lemay. The outer shell was created by architect Etienne Gaboury. The statue was originally unveiled in December 1971 and stood on the Manitoba Legislative Building grounds. Some protested the statue of a man they still viewed as a traitor. Many Métis people protested the naked, distorted figure as an undignified representation. Lemay claimed Riel’s face was contorted in anguish and his body naked and twisted to show he was a martyr, who suffered for his people. During the statue’s 24 years on the Legislative grounds, it was attacked many times by vandals. 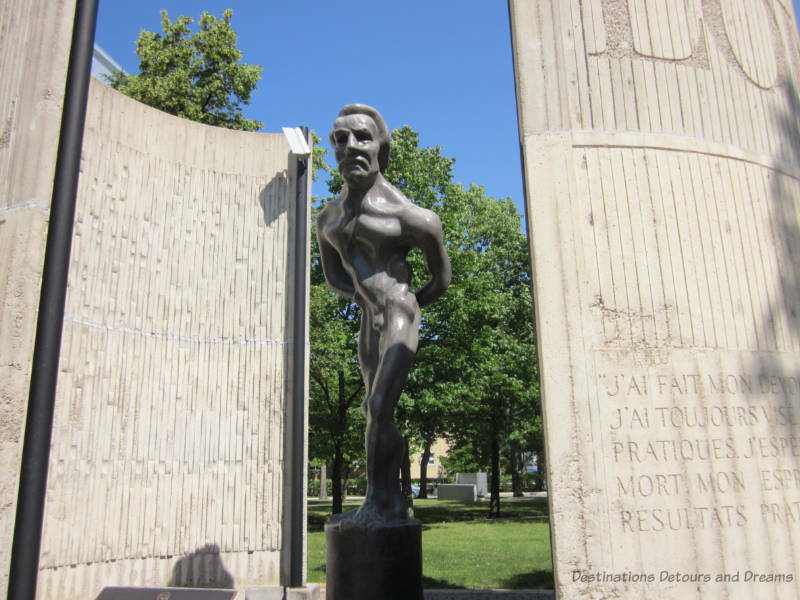 In 1996, a Louis Riel sculpture by Miguel Joyal was unveiled on the grounds of the Manitoba Legislative Building, replacing the one that was moved to St. Boniface College. The Legislative Building opened in 1920. 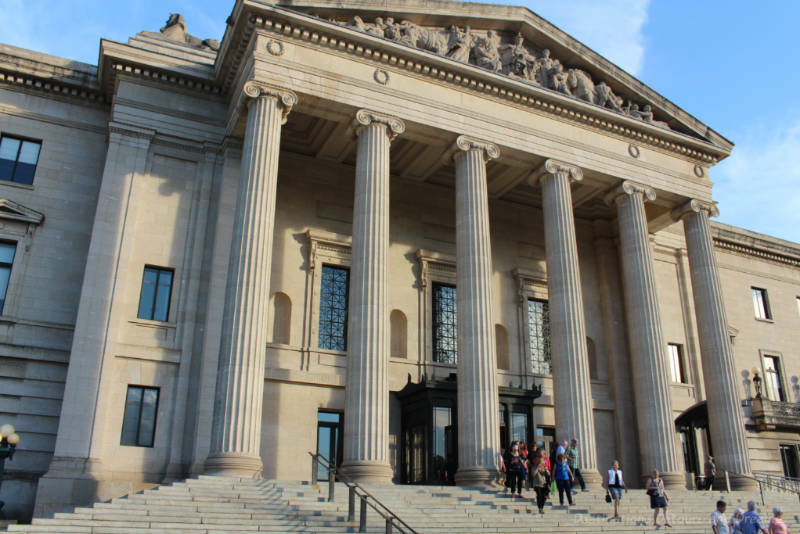 The exterior walls of the Beaux-Arts Classical building are made of Tyndall stone. Inside is a grand marble staircase flanked by life-size bison sculptures, a rotunda with Corinthian columns rising to the building’s central dome, and numerous symbolic works of art. The building is open daily to visitors. 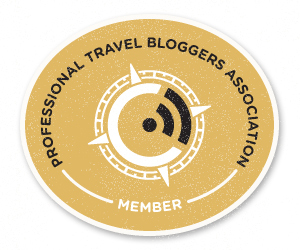 Tours can be scheduled during summer months. A unique tour, the Hermetic Code Tour, in which Dr. Frank Albo explains his interpretation of Masonic symbols in the building also runs from April to October. 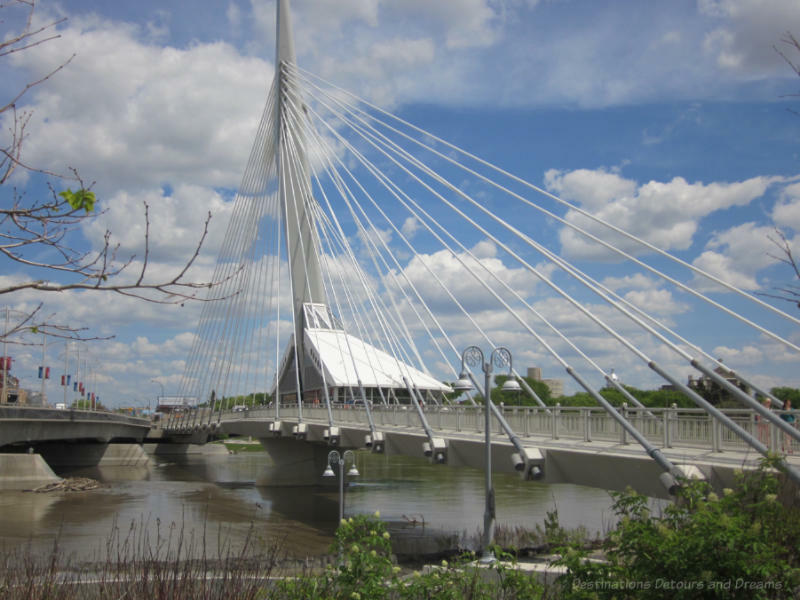 The picturesque cable-stayed pedestrian bridge linking St. Boniface, Winnipeg’s French Quarter, with downtown is named after Louis Riel. Esplanade Riel sits beside Provencher Bridge, the bridge for vehicular traffic, and is the only bridge in North America with a restaurant on it. This is great Donna. I have been to and blogged about many of these places- although not the Riel home. 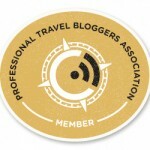 I have to put that on my list. 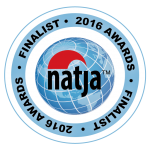 But it is so handy to have all the sites listed in one place like this! Thanks MaryLou. Riel House is close to where I’ve lived for the past 4 years, but I only made it there this summer. That’s a pretty interesting story. Father of the province and hanged for treason. Thanks Ken. 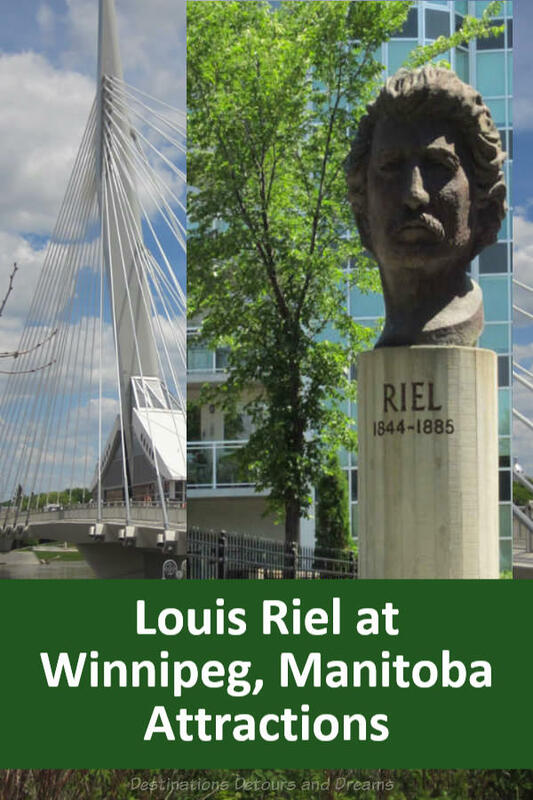 There is a lot more detail to the story of Louis Riel than I could cover in a short blog post. Quite fascinating, particularly if you read it from different perspectives.